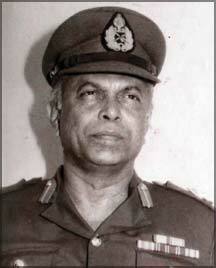 General Nalin Seneviratne VSV the 10th Commander of the Sri Lanka Army died on August 12, 2009 aged 78 years. He joins in Valhalla those who were in the thin red line of defenders of the nation who predeceased him. History will record that he was the first Army Commander who defeated the LTTE in 1987, resisting attempts by the faint hearted to abort the epic Vadamarachchi battle in its first hour. The war was finally won when the LTTE was wiped out in May 2009. He will be remembered for his almost boyish enthusiasm in whatever he did, his approachability that made subordinates believe he was human and available at all times. He had great moral strength to lead in times of exceptional stress and misfortune as in Jaffna in the mid 1980s and the courage of his convictions to stand up for his subordinates. He had sincerity and charm to mean what he says and deal with compassionate cases and community issues. He however lacked somewhat in showmanship which some excelled in, although he made sure of success of the army he led in war which was what mattered. While there may have been a lacuna in his tactical knowledge being an engineer, he made up for it by getting to know, even though late, what was needed to be done. Good judgment and decision making followed easily. He would give his subordinates a reasonable 'free run' but no one doubted that he knew when to seize the reins himself. Being a leader by example he was a superb communicator and encouraged, even provoked his subordinates to give him ideas and even advice as he was sure of his own ability to ensure success. His subordinates knew he really cared for them and their ambitions and rallied round him. He involved himself wholly with everything in the army and everybody in it. There were no cliques and favourites. Hopefully he was not the last of the Mohicans. The 6 foot General was educated at Royal College, Colombo. He joined the then Ceylon Army and was commissioned into the First Field Engineer Regiment Ceylon Engineers from the Royal Military Academy Sandhurst on July 30, 1953. He followed the Royal Engineer Young Officers course at the School of Military Engineering Chatham UK before returning. Much later in the 1960s, he followed the Engineering Officers' Construction, Planning and Operation Course at the US Army Engineering School, Fort Belvoir USA, the first Sri Lanka Army officer to be trained there. Much later in the 1980s, he followed the National Defence College course in Delhi before he took command of the Army. When he did so, he also became the second engineer officer to command the Army following General Denis Perera, a very hard act to follow, as standards had been set that did not exist before. He made sure they were kept. Much of his service was within the folds of the Field Engineers including his period of command of the Regiment which while honing his expertise as an engineer inhibited his knowledge of many officers in the army, something he needed to work on when he became Army Commander. He did so by visiting regiments all over the country including when they were on field training. He served as staff officer to the Commander Task Force Illicit Immigration (TAFII) and was based in Mannar in the 1960s. He was the first Commander of the Engineer Group (1977-1980) and then the Support Group (1982-4). He took a stint in a civilian government job in the UK offered him by Minister Lalith Athulathmudali. He was also Commander of 54 Force HQ in Jaffna. He commanded the Sri Lanka Army from 1985 to 1988 having taken over from Lt Gen Tissa Weeratunge. The zenith of his tenure as Army Commander was the victorious 1987 Vadamarachchi battle in which the LTTE were decisively beaten. The nadir was the forced induction of the IPKF into Sri Lanka in 1987 which he with the other two Service Commanders vehemently opposed. He had tremendous moral courage which was tested to the hilt when he was hemmed in the Jaffna fort in 1984, yet he made sure while the soldiers morale was high that it was not at the expense of the people of Jaffna and that they were not unfairly affected by continuing military action. There was little if any co-lateral damage. The late Maj Gen George Thevanayagam who was a Sinha Regiment officer and was himself from Jaffna summed it up when he said that the people of Jaffna would not harm Gen Seneviratne even if he was to walk its streets in the dark. This was echoed by many Jaffna civilians too. Gen. Seneviratne intuitively grasped the essence of a problem posed and revealed in finding a solution which those affected at the end possibly believed was their own. He also had a rollicking sense of humour and could add stinging wit to it when called for. It made many careful not to ask or expect anything that took their personal fancy. He was a natural leader of people as he led by example. He never asked anyone to do anything he himself had not done or was unable to do. He was upright and straightforward. The standards of conduct, behaviour and integrity set by him and General Perera are the ones that the Army still tries to emulate. Like all Engineer officers most of them over 6 foot tall Gen Seneviratne was also good at games. He played rugby for the Engineer regiment and the Army. The Engineers tradition of carrying out national development projects in many parts of the island continued under then Col Seneviratne especially in the Mahaveli H2 area using heavy earth moving machinery of the Plant Squadron. He was very proud of their achievements. After leaving the Army he was a very effective and efficient Governor North East Provinces. He also did much to improve the welfare of his staff by finding and constructing suitable living quarters and generally improving their living standards. Yet he spent little on improving his own residence which latter is the first thing some others gave priority to on appointment. Gen Nalin Seneviratne who was not in good health at the end, leaves behind his wife Mala and their only child Dushyanthi married to Khavan Perera and their two daughters. All ranks of the army who served in his time and his numerous friends and relatives will miss him very much. He will be remembered by all for a long time to come and his contribution to the Sri Lanka Army and his regiment will be well recorded in history.